Good morning, I’m your host and the creator of Alkaline Water Machine Source, Hercules. Today, I will teach you how to raise pH in well water without having to dig a giant hole. After doing enough research on alkaline water to make most people think I’m obsessed in an unhealthy way, I’ve found several ways to safely raise pH in well water. This is a good and bad thing, depending on what methods you use to raise the pH of your well water. What should you do if your well water is hard? If you already know everything there is to know about pH, you can skip to the next section by using the link in the table of contents or scrolling down. One of the main reasons I started this site is to help people understand why the pH level of drinking water is important and that we’ve been duped into drinking slightly acidic water for most, if not all, of our lives. You can see my list of Top 25 Alkaline Water Benefits by clicking here to see all of the amazing benefits people are experiencing around the world. Now, the good news about well water is it usually has a neutral pH. I completely agree with everything he says, especially that well water is healthier to drink than unfiltered tap water. It’s also important to note that conventional water filters, including Brita and PUR, can actually make our drinking water more acidic. Here’s a quick science lesson; I promise I won’t get longwinded. The term pH stands for “power of hydrogen” in most scientific circles, but the “p” in pH is debatable. Substances with the lowest pH are more acidic, and substances with the highest pH are more alkaline. One of the biggest mistakes people make is to think that the higher the pH in water, the better. This is a dangerous thought process. If you choose to drink alkaline ionized water, which is extremely healthy, it’s best to stay in a pH range of 8.0 to 9.5. Start with pH 8.0 water and work your way up. If your well water isn’t hard, then the best method of raising the pH is to use some type of alkaline water filter in your home. I know some of you are looking to begin your healing journey with the help of alkaline ionized water. The best method for safely boosting the pH in your well water is to install a reliable alkaline water machine in your home. With an alkaline water machine, you can choose the exact pH you want. They also have activated carbon filters built right in, which means you’re knocking out two birds with one stone. 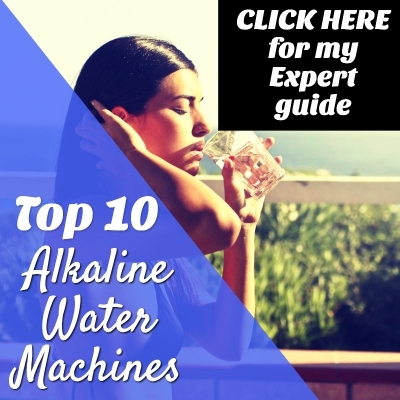 You can click here to see my list of top 10 alkaline water machines. If you are new to alkaline water, I recommend checking out the most affordable ionizer by clicking here. It’s manufactured by a trusted alkaline water brand and comes with a lifetime warranty. I’ve done my research on the brand, Air Water Life, and they are a great outfit. Most of their customers know the customer service reps on a first name basis, and the reviews for their company are all glowing. First, I want to note that having minerals in your water is a good thing. It’s only when there is an excess of minerals in your water, “hard water,” that you may need to filter the water first before it enters the alkaline water machine. This way, you remove the excess calcium in the water. The best way to filter the hard well water is by using a three-stage prefiltration system for your ionizer. The best one I found is the iSpring US31. Several current owners of the unit say that it makes water taste great and works better than a reverse osmosis system. A second option is using a whole house filter. The DuPont WFPF13003B Universal Whole House Filtration System will get the job done, and it’s very affordable. If you want to raise the pH of your well water the right way, you should avoid using a basic reverse osmosis water filtration system. The problem with RO water is that it has zero minerals in it. If your water has zero minerals, then you can not properly ionize it in the alkaline water machine. Going back to what I said before, most people think higher pH equals healthier water. The “ionized” part of alkaline ionized water is where most of the health benefits come from. However, there is a reverse osmosis water system that you can use to safely raise the pH of your well water without owning an alkaline water machine. The APEC Top Tier Alkaline Mineral pH+ 75 GPD 6-Stage filtration system is a great way to raise the pH of your well water. It first filters your water, then remineralizes it using a mineral cartridge produced in the United States. One woman in her 60s praised the “crisp” taste of the water. The mineral cartridge contains premium calcium carbonate, which safely raises the pH of your water. I also like the fact that this system removes fluoride that could be lurking in your water. Although, well water shouldn’t have dangerous levels of fluoride like some tap water does. My only qualm with this system is that you first remove all the minerals from your well water. If you use the three-stage filter and alkaline water machine, you will get a wider range of healthy alkaline minerals in your water. There are also alkaline water filter pitchers available these days that filter your water before adding alkaline minerals to it. These new pitchers are similar to Brita and PUR water filters but are much better in my opinion. With these pitchers, you know that you are raising the pH of your water instead of lowering it. Here is my top pick for an affordable alkaline water filter pitcher. You need to replace filters more often than with an alkaline water machine. Alkaline water machine filters usually only need to be replaced 1 or 2 times a year. You can only filter a certain amount of water at a time (3.5L). The water isn’t packed with antioxidants and energy like the water that comes out of an alkaline water machine. Cleaning the pitcher could be a bit of a pain. Alkaline water machines clean themselves. Having listed those cons, I still think an alkaline water pitcher is a huge step up from a conventional water filter pitcher and a great way to raise the pH of your well water. The beauty of an alkaline water machine is that it uses the minerals that are already in your well water to raise the pH. Other options strip minerals from your water, then add back more alkaline minerals to raise the pH of the water. Why not use what’s already there from the Earth to raise the pH of your drinking water? Other options that should be your last resort are alkaline water bottles or alkaline water drops. I’m personally not a fan of alkaline water drops, and the technology in alkaline water bottles still has a ways to go. Alkaline water bottles raise the pH of your water by using a built-in mineral cartridge inside the stainless steel bottle. For these to work properly, you’ll have to filter your water first anyway. I’ve also read reviews written by people who complained about the cups sweating and not holding temperature well. The best combination for drinking water and raising the pH in your well water is an alkaline water machine and a YETI cup. If you invest in this combination, it will pay for itself, and you’ll be adding much less plastic waste to the environment. My friend introduced me to the YETI rambler a few years back, and I’ve never seen anyone in my life love a cup so much. The verified online reviews for YETI cups are phenomenal. One person said it keeps ice for over 24 hours. I’ve seen my buddy drink a cold smoothie or yogurt hours later out of his YETI cup in the summer. When you store your alkaline ionized water in a YETI cup, you keep your water away from oxygen and light. Oxygen and light can quickly degrade the health benefits of your ionized water. That’s why I recommend avoiding buying bottled alkaline water in bulk if possible. Storing you alkaline ionized water in an airtight container preserves the negative ORP. The ORP is a measure of the number of antioxidants in your water. To read more about why negative ORP water is healthy and helps prevent premature aging, click here. I do not recommend using baking soda to raise the pH of your drinking water. I did this twice about ten years ago, and both times, I felt pain in my knees afterward. According to this article, you can only raise the pH of your water to a maximum of 8.4 using this method. I love lemon water, but I’m not sure about its effectiveness as a pH booster. The claim is that lemon water raises the pH of your body after it enters your body. We all know that lemon juice is acidic on the outside. I need to do more research on this method before I can draw definite conclusions. In my experience, nothing works better than alkaline ionized water if you’re after the health benefits of alkaline water. An alkaline water machine gives you an unlimited supply of incredibly healthy water. Plus, you can choose the exact pH of your water while getting a ton more anti-aging antioxidants in every glass. Alkaline water machines also produce acidic water that can be used for cosmetic use, household cleaning, or watering some varieties of houseplants. This is another way to save money on household cleaners and avoid using harmful chemicals in your home. Acidic water is naturally antiseptic. I’ve read positive reports written by people who were able to clear their adult acne by washing their faces with the acidic water produced by their water ionizers. Do your research and decide which alkaline water machine is right for you. My Top 10 list is the perfect resource. If you choose to buy an alkaline water bottle, make sure you filter the water first. 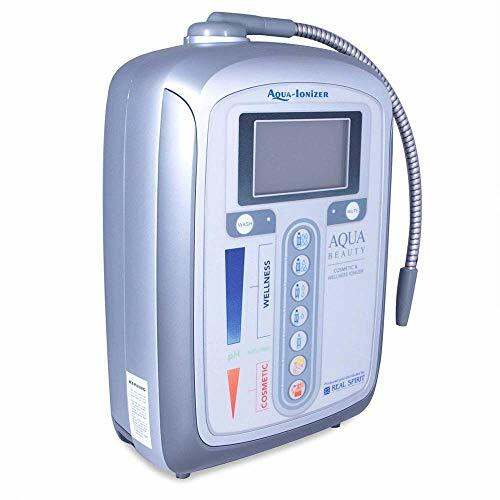 Overpay for an alkaline water machine. The ionizers I reviewed on my site are from trusted companies and will get the job done. Cheers and best of luck safely raising your pH! If there are any solutions you think I missed, please share your ideas in the comments section below! Love is not as important as good health. You cannot be in love if you’re not healthy. You can’t appreciate it.